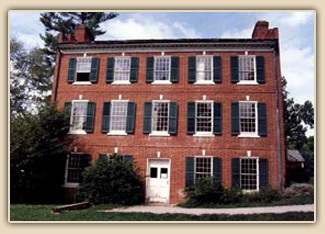 The three-story Jonathan Hale House was built in 1826 in Bath, Ohio. The original structure was expanded with the addition of a west brick wing in the 1830s and two nineteenth-century frame additions. The Hale Farm and Village is owned and operated by the Western Reserve Historical Society. The architectural firm directing the restoration of the Hale House requested our services in the analysis of the building's historic finishes. Following a paint analysis on the building exterior, the architect wanted to thoroughly examine the interior paints and wallpapers to determine a series of decorative finishes appropriate for the period of interpretation chosen for the restoration of the site. Frank S. Welsh made a brief initial visit to the Hale House. He reviewed the site and instructed the architects in sampling techniques, as illustrated in the Paint Sampling Guide developed by Welsh Color & Conservation, Inc. The architect subsequestly took numerous samples and mailed what she had collected, augmented by historical information, photographs and floor plans to contextualize the physical evidence. A preliminary examination of paint finishes was performed in our lab, and general layer and color chronologies were developed for the interior spaces. The architect also shipped three painted boards with attached wallpaper from several of the interior rooms. The boards were original to the Hale House, but they had been moved and reused as floor infill around two fireplace hearths. Welsh Color & Conservation, Inc. examined the paint layers and the wallpapers and investigated the physical and stylistic characteristics of the papers to estimate their ages. Based on these dates and the period of interpretation for the building restoration, we determined which papers were candidates for reproduction. Through comparison to the paint layer structure of samples taken earlier, we were able to determine the boards' original room locations within the house. Finally, to coordinate all investigative results, the initial paint samples were reevaluated for color matching of specific paint layers for use in conjunction with the wallpapers. In order to date and therefore authenticate the wallpapers, we researched the historical contexts of their pattern styles, determined the methods of their manufacture and microanalyzed the fiber content of each one. In addition, we analyzed the pigment composition of the paints used to produce the patterns. This process authenticated one of the papers (at right) as dating between the mid-1840s and 1860. 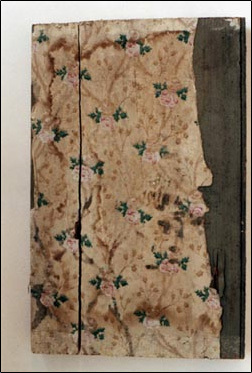 Since this floral wallpaper fragment exhibits a full repeat of the pattern, its reproduction will be facilitated in the eventual restoration of the Hale House. Polarized light microscopical analysis of this floral wallpaper's fiber content and paint pigment composition helped to date it to between 1840 and 1860, which is the period of interpretation for the Hale House.